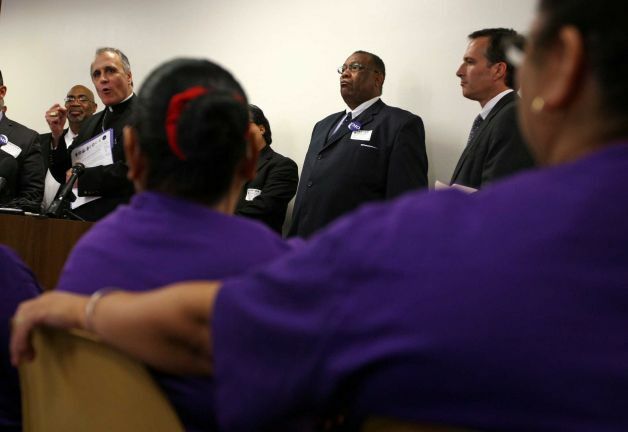 Cardinal DiNardo and TMO clergy held a press conference exhorting contractors to give Houston janitors a raise. "I appeal to all people of good will, especially in the great city of Houston, to be in solidarity with janitors as they seek a modest pay increase over a three-year period. The increase would amount to $10 dollars an hour in the third year," Archbishop Daniel Cardinal Dinardo said." After weeks of striking and demonstrating, Houston janitors unanimously voted to ratify a contract that would increase SEIU member's wages by $1 over a four-year period.